Fly tipping is to blame for the destruction of one of Peterborough's most ancient properties, say fire officers. 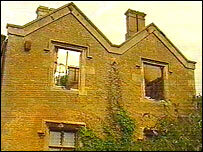 Grade ll listed Oxney Grange was destroyed by fire in the early hours of Wednesday. Fire officers now believe the fire was started by arsonists using rubbish dumped by fly tippers. Ray MacDonell of Peterborough Fire Service said: "What's happened here is that somebody's seen a convenient place to fly tip, and others have followed suit. "This has ultimately resulted in this beautiful building being burnt down." Parts of Oxney Grange date back to the 12th Century. It was a farm that fed the monks of Peterborough Abbey - now the cathedral. The building had been derelict for five years, but was due to be converted into luxury flats.